Can Mike Budenholzer lift Milwaukee to top of East? This is the latest of NBC's NBA season preview stories, and we will post at least one a day on these pages until Oct. 16, when the NBA season kicks off. We will look at teams and topics around the NBA throughout the series, with today the Bucks and their new coach in the spotlight. Jason Kidd was enshrined in the Naismith Basketball Hall of Fame just more than a week ago, and with that came the flood of memories (and videos) of what a legendary player he was at his peak, leading the New Jersey Nets to the Finals in the early 2000s. Unfortunately for the Milwaukee Bucks, coach Jason Kidd's offensive and defensive philosophies seemed stuck in that same era. The Bucks' corner offense was run at a slow pace and lacked much strong-to-weak ball movement or shooting that would have created space for stars to operate. Kidd's defense was ultra aggressive to the point teams turned that against the Bucks with a couple of passes, which led to quality shots. In spite of that Milwaukee kept winning because of Giannis Antetokounmpo, Kris Middleton, Eric Bledsoe, and the talent on the roster, but talk to other teams around the league and they did not fear the Bucks. What they feared was the day the Bucks started using that talent in a modern way. The former right-hand man to Gregg Popovich who went on to coach the Hawks to a 60-win season was brought in as an Xs and Os guru who would simplify the defense, then put Antetokounmpo and other Milwaukee players in a faster offense that worked to get their stars better looks. How much can a coach and a system lift a team? Milwaukee is going to find out, and they are betting it's a lot. The Bucks don't want to waste seasons of a top-10 player, a potential MVP such as Antetokounmpo (plus they are moving into a new arena in the heart of the city, this is win-now time in Milwaukee). Budenholzer has never had a talent like this on his roster as a head coach, and one of the first things he did was have a breakfast with the Greek Freak and talk about how together they would get him to take the next step. "There's a lot of reasons to be excited about coming to Milwaukee, but there's no doubt that Giannis is one of them," Budenholzer said at his introductory press conference this summer. "He's so important to our success, I think he embraces his leadership role and how he needs to grow, improve and get better along with all the rest of us. So the excitement is through the roof, and how we can use and implement him defensively and offensively, it started some at breakfast and it will continue into the weight room today, tomorrow and the next day. "And those are conversations I look forward to having with Giannis, and listening to Giannis too. I think he's a smart player at 23, and he has an IQ and an understanding of the game. Together, I think he and I will push each other, but I look forward to pushing him. He believes it and I believe it, but he's going to get a lot better as we watch him over the years." "A lot better" Antetokounmpo should scare the rest of the league. Budenholzer's offensive philosophy and motion offense fit better with the Bucks' talent. He wants to run and get the ball out in transition, then use pace, misdirection, and side-to-side ball movement to create space for their stars to work in the half court. Then there's the floor spacing, the Bucks were 25th in the league in percentage of shots from three, but a new philosophy and adding Brook Lopez and Ersan Ilyasova this offseason should help change that. The Bucks are going to shoot threes and that should open up lanes for Antetokounmpo and Bledsoe to get to the rim. This should look like a different Bucks team. However, the bigger changes and improvements need come on the other side of the ball. Despite the dated style under Kidd, the Bucks still had an offensive rating in the top half of the league. The defensive side, however, was the Bucks' biggest weakness. "The thing that probably stands out to me first is the potential on the defensive side of the ball," Budenholzer said. "I would say that's been always something that's prioritized. We want to be great on both sides of the ball, and whether it be the last five years in Atlanta as a head coach or San Antonio at the end of the day has always been great defensively." Budenholzer has talked about simplifying the system and reads on defense, something that should be welcomed in the Bucks' locker room. The team has good defenders on it, just put them in better positions and understanding the system should improve the Bucks on that end of the court. 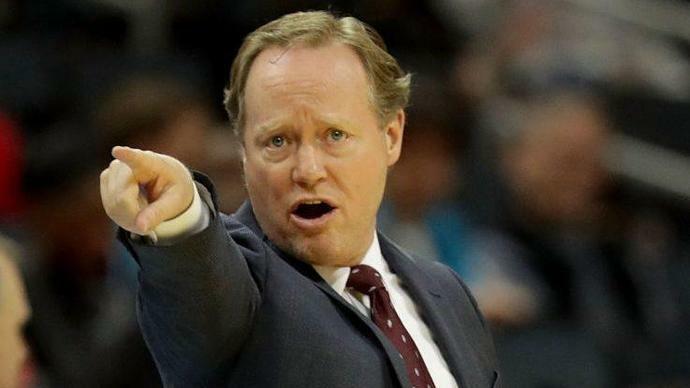 Can Budenholzer make the Bucks a threat to Boston this season? Unlikely. But if everything comes together in a new system, how good can this Bucks' team be, if Antetokounmpo looks like an MVP candidate again and the defense is improved. Philadelphia and Toronto may want to look over their shoulder and keep an eye on the Bucks. This team might finally start living up to its potential. Giannis Antetokounmpo led the Bucks to a sweep over Detroit, and Donovan Mitchell kept the Jazz alive vs. Houston on Monday.